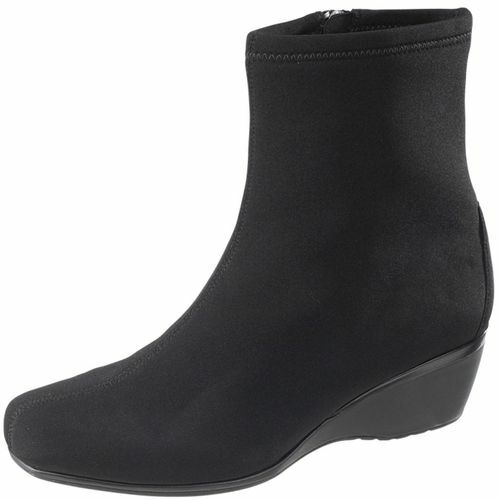 The Aetrex Essence Carolyn Ankle Wedge Boot offers style and comfort to keep your feet warm. The Aetrex Ankle boot is made out of either Italian calf skin leather or four length side zipper. All the Essence Boots feature insoles made with memory foam and plenty of room for custom orthotics making them the most comfortable footbed for boots in the industry. Ankle boot with side zipper for easy on/off wear. Innovative removable insole made from a combination of memory foam and PU for comfort and pressure relief. Accomodates custom orthotic insoles. Waterproof soft napa leather or four way stretch fabric upper Sealed seam construction for waterproofing. Elastic back gore stretches to fit wider calves. 14/8” lightweight PU wedge for cushioning and support Rubber outsole for shock absorption and resilience Soft fabric linings for maximum comfort.